Lt. Gov. Brian Calley has been trading accusations with Republican rival for governor Bill Schuette about which man has worked harder for the people of Michigan. As the Michigan GOP primary race for governor enters its last days, the chief rivals have traded blows over which candidate has skipped more work. Now Calley strikes back, with a TV ad airing the last two weeks of the race that says Schuette is “off duty,” alleging he worked just over 100 full days in nearly eight years as attorney general. The startling claim is entirely based on the campaign’s analysis of Schuette’s official work calendar, obtained through a Freedom of Information Act request. We rate the claim inaccurate even as Calley raises legitimate concerns about Schuette’s alleged penchant for mixing work duties with political or campaign efforts. In a July 24 news conference tied to the launch of the ad, Calley said that analysis of Schuette’s office calendar found that he worked just 104 “full” eight-hour days out of nearly 2,000 working days since he took office in 2011. He said that averaged out to less than one full work day for every 3.75 weeks, for a job that pays Schuette $112,410. A full work day, by Calley’s definition, is any day in which there were at least eight hours between Schuette’s first event of the day and the end of the last. Calley acknowledged Schuette could have been working during times when his schedule showed no events, meetings or other official duties. But he said he was “very generous” in how he calculated Schuette’s schedule, noting that on many days the calendar was blank. “There are very wide amounts of nothing on there," Calley said, speculating that Schuette spent much of his time as the state’s chief legal officer on unrelated political activities. “He sent political emails, scheduled and conducted political calls and encouraged senior staff in the AG's office to do the same thing,” Schrimpf told Truth Squad. The campaign also pointed to a potentially explosive report released Wednesday by Progress Michigan, a liberal Lansing advocacy group, that alleges Schuette and his staff used public time and resources over nearly a decade to conduct political activity. Calley told Truth Squad there is a stark contrast between what he says is on his own crowded calendar and the emptiness of Schuette’s schedule. It's worth noting that the date of that reported 2015 presidential politics conference call – Aug. 17 – Schuette’s official calendar was blank. Indeed, Calley, who touts his own breakneck office schedule, declined to release his calendar – which is not subject to public records requests because the state’s executive branch is exempt from FOIA. “The problem is that by releasing my calendar it releases other people’s calendars in my office,” Calley told Truth Squad. Calley said this even as he continues to say he favors changing the FOIA law so the executive branch is not exempt. Schuette spokesperson Andrea Bitely says Schuette does lots of work that doesn’t show up on the calendar. She added: “Attorney General Schuette runs a 500-person law firm that handles 40,000 cases a year, including some of the largest and most important cases in the history of our state that everyone knows about,” she said, including prosecutions in the Flint water crisis and of Michigan State University sports doctor and sexual predator Larry Nassar. Truth Squad picked a couple weeks from March 2018 that seemed typical of Schuette’s schedule and asked his campaign to account for his time those weeks. His schedule for March 5 through March 11 shows three days with nothing scheduled – Tuesday through Thursday, along with one item on the calendar Monday and two on Friday. The next week Schuette also had nothing scheduled Tuesday through Thursday, with five entries on Monday and two on Friday. Bitely said Schuette was with family on personal time March 5 through March 8 celebrating his son’s completion of a master’s degree. The following week, when the calendar showed nothing for March 13, Bitely said Schuette gave a speech to the Rochester Rotary Club about trafficking and illegal drugs, and “did state work” during the 1 hour and 38-minute drive to and from the event. On March 15 – when his calendar also showed nothing – and on the following day, Bitely said Schuette was in Washington D.C. for a St. Patrick’s Day event hosting the prime minister of Ireland at the invitation of President Trump, then at similar event at the invitation of Vice President Mike Pence. She shared an email of the vice presidential invitation. Both Washington D.C. events were labeled as official – as opposed to political – events. Bitely said it was not a political trip, even though Schuette’s been endorsed by Trump, a fact Schuette repeats at every opportunity on the campaign trail. Calley’s claim that Schuette is “off duty” rests on a dubious leap in logic: If Schuette has nothing on his schedule, that means he’s not working. That’s possible – but so is the opposite. And the burden is on the candidate making the accusation to support it. Calley admits himself that Schuette may have been working during times when his calendar is blank, as Schuette spokesperson Bitely argues the record for his March activities reveals. 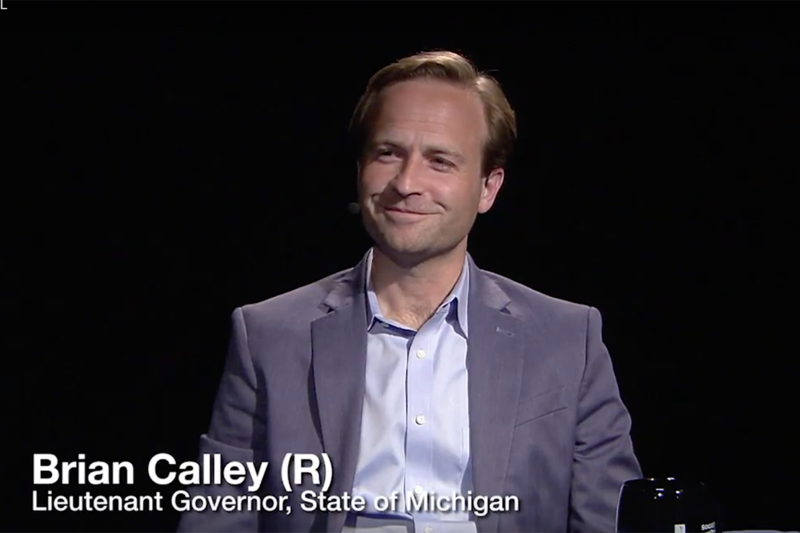 Calley’s campaign suggests that the empty calendar days meant Schuette was working on political matters instead. It offers as proof recent reports that Schuette mixed politics with state business, reports that raise legitimate questions about Schuette’s priorities as attorney general. The debate over what’s-official-versus-political travel is hardly new, nor is it confined to state politics. The nonpartisan Washington, D.C.-based Campaign Legal Center has wrestled with such questions for years, and suggests a reporting system that errs on the side of transparency by forcing members of Congress to identify their official travel “on the Internet in a searchable, sortable, and downloadable database format.” Perhaps Lansing could require the same. In the end, the accounts of Schuette’s mingling of political with official business, however troubling, do not justify the more sensational conclusion that Schuette “barely worked 100 full days in nearly eight years” in public office. And Calley’s standing to make this charge is hardly burnished by the fact he won’t release his own calendar. What party investigates the claims in the Michigan Truth finder?